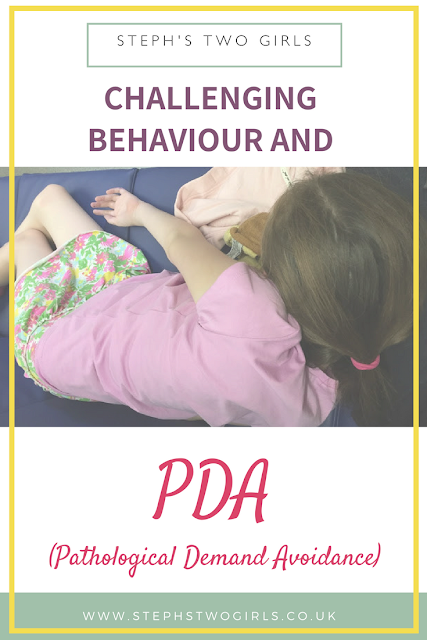 'Challenging behaviour' is a phrase which has been mentioned at quite a few of the events I've been to lately, and every time I hear it, I want to stand up and ask if anybody has considered Pathological Demand Avoidance (PDA) for those children. I'm planning to cover the second sentence above in a separate blog post but have left it in for now to explain the term. Some would have preferred PDA to be called Newson's Syndrome, as the 'pathological' seems to be often misunderstood, but demand avoidance alone doesn't explain the full extent of this condition. So Pathological Demand Avoidance is where we are at. 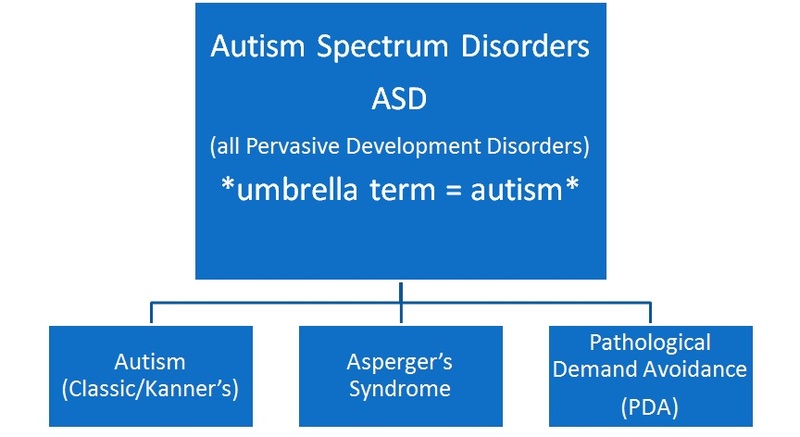 This basic chart shows that PDA is a sub-type of Autism Spectrum Disorder, in the same way that Asperger's Syndrome (AS) or classic autism are. There's a slight confusion over terms in society now, as the word 'autism' seems to have become an umbrella term for ASDs. So it may be said that 'PDA is a type of autism', but what is actually meant is that PDA is a type of ASD. There are few children or adults with a straight forward PDA diagnosis so far, mainly because the term is relatively 'new' in medical terms. I say relatively, because this term has in fact been around since the 1980s when Elizabeth Newson published early research on PDA. If we compare that timescale to that of Asperger's Syndrome though, which was first diagnosed in 1944, but not recognised in diagnostic manuals until the 1990s, then we probably still have a few more years to go for wider recognition of PDA. The truth is that the more you try and make a child with PDA fit into the system, by following typical parenting or education strategies, the more likely they are to feel forced into behaviour which challenges. I'm not suggesting that every child classed as 'challenging' should have a PDA diagnosis, but I am convinced that more children have it than has yet been acknowledged. Of course, as with all types of Autism Spectrum Disorder, there's a spectrum (the clue is in the name). That doesn't mean that everyone of us is on that particular spectrum (I'm not a fan of the 'we're all a little bit autistic' phrase that I've heard before, and there's a great blog post over at Unstrange Mind which describes it perfectly) but it does mean that some children with PDA are able to hide their difficulties in school and work extra hard to conform when there. What that leads to though, is the pressure cooker effect - as soon as they are home, the lid flies off because they have to release that stress and anxiety somehow. 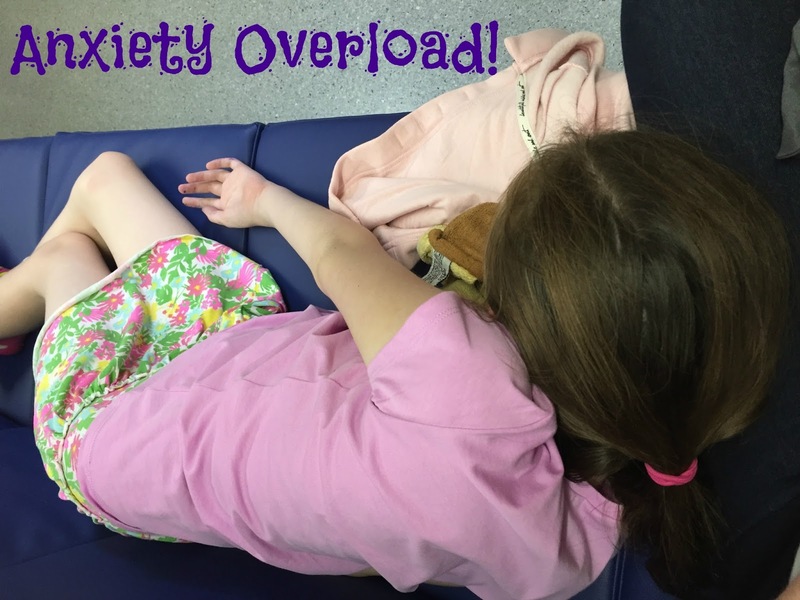 For some, that can happen at the school gate on their way out; for others the comfort of home is what can enable them to feel comfortable enough to let rip. I've always counted myself lucky that our girl is 'constant'. She doesn't mask at school, her struggles are obvious. She's not violent or aggressive when unhappy or anxious; instead of 'fight or flight' she tends to freeze. As a young child she would 'mushroom' - by that I mean crouch down on the floor and become as heavy as a sack of potatoes. These days she is more likely to stay sitting at her desk but with her head on the table, as a way of withdrawing from it all when it becomes too much. On the school days which have not gone so well for any reason, I have to go in and collect her from the classroom, where I will find her in this position. It always seems strange that she doesn't want to just run out of the school doors to get home where she knows everything will be OK and comforting, but it's as if she is rendered incapable of functioning properly. The children who struggle with the build up of everyday demands and who lash out are seen as challenging. People wonder how to 'deal with' them. I'm a strong believer in 'all behaviour is a form of communication'. It's whatever has caused that behaviour in the first place which needs to be understood and worked on. In the case of PDA, there are different strategies to use which will be totally alien to most parents - going round my head is that famous line 'this is parenting, Jim, but not as we know it'. Typical parenting strategies involve showing the child that the parent is in control. With PDA, the child needs to feel like they are the ones in control - which involves some pretty exhausting forward planning and game playing (that those with PDA must never find out about....). I'll come back to strategies another time, as I could fill pages with them, but for some quick reading try the PDA Society suggestions, or the Autism West Midlands advice. A man who has spent a lot of time with children and young adults who have behaviour which challenges is Dr. Ross Greene. His belief is that kids do well if they can. There are a lot of free resources on his website which I'd heartily recommend - start with the Walking Tour for Parents or for Educators. His strategies are not specifically for those with PDA, and many can benefit from them. As adults, I believe we need to look at the cause a bit more often and help find a solution, rather than opt for the generic carrot and stick approach which really doesn't work for a whole group of children. If you know of a child with challenging behaviour (and please try to refrain from using that word 'naughty'), then maybe pass on information about PDA and Dr. Ross Greene to whoever works or lives with them. It might just change the life of the child and of all those involved with them. The PDA Society website www.pdasociety.org.uk is the first place I'd point them to, and for young children up to the end of primary school age there's a great booklet to download here. I'm always open to questions too!